Fort Mechanic is shown on Joseph Purcell’s 1796 plat. 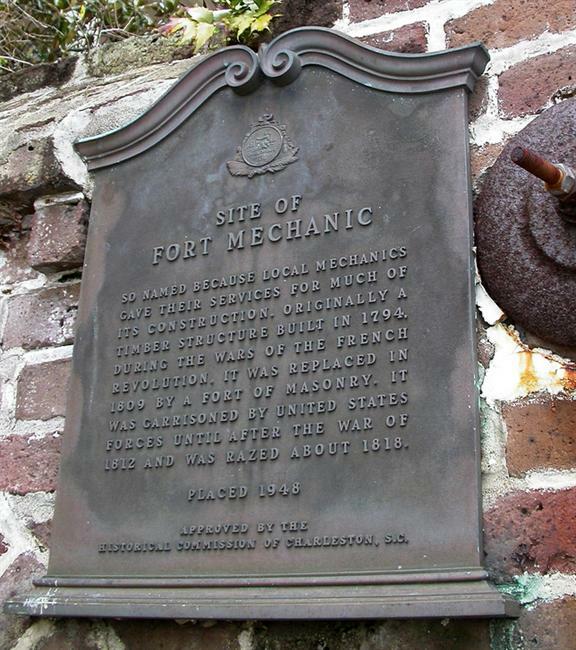 Fort Mechanic was built in 1794 at a point where high ground extended nearly to the edge of the Cooper River. This site had been fortified in the 1750s, and again during the Revolutionary War, before international hostilities in the 1790s forced a new round of defensive construction in Charleston. A brick Fort Mechanic replaced the wooden fortification in 1809. On the site of this series of forts are now three notable East Battery residences. When the Seven Years War (French and Indian War) broke out in 1756, Charles Towne’s British officials strengthened the city’s defenses against a possible attack. Royal Governor James Glen hired William Gerard de Brahm to design a citywide fortification plan; its implementation continued into the term of Glen’s successor, William H. Lyttelton. On November 8, 1757, the Commissioners of Fortifications recorded that "The Middle Bastion between Broughton's Battery and Granville's Bastion being finished and cannon mounted therein, and his Exc'y the Governor being acquainted therewith, he agreed with the Commissioners to meet there on Thursday next (being his Majesty's birthday) … to drink his Majesty's health and name the said Bastion." The new middle bastion was named for the governor himself, Lyttelton’s Bastion. Fears of invasion subsided in 1763, and Charleston’s defensive works were ignored for years. During the Revolutionary War, a belt of waterfront fortifications "formed of earth and palmetto wood, judiciously placed and mounted with heavy cannon,” were placed around the peninsula in early 1780. Lyttelton’s Bastion was rebuilt and garrisoned by Captain Joseph Darrell’s Company of Cannoneers, members of the South Carolina militia. The fortification was often called Darrell’s Battery, but in his Memoirs, General William Moultrie referred to the twelve-gun battery as Lyttelton’s. After the British evacuated Charleston in December 1782, the city’s fortifications were again neglected. In the 1790s, with the war between Great Britain and France threatening the United States, the federal government appropriated funds for improving coastal ports and harbors. Secretary of War Henry Knox engaged eight French-born military engineers to design and construct the works. 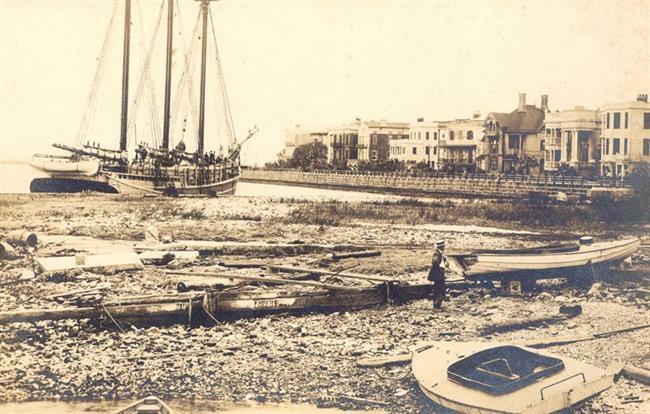 He ordered Paul Hyacinthe Perrault to erect three sets of batteries, each with magazines and hot-shot furnaces, mounting seventy-two guns in all, around Charleston Harbor. Arriving on May 4, 1794, Perrault found Lt. Col. J. Christian Senf, military engineer on Governor William Moultrie’s staff, already building a battery on the site of Lyttelton’s Bastion. Perrault continued the work that Senf had begun. Perrault’s plan was for four fortifications to protect Charleston: Fort Johnson, Fort Moultrie, a new fort at the southeast tip of Shute’s Folly island, and the new battery on East Bay Street. Congress had requested that local interests supplement federal funding, and the citizens of Charleston pledged financial support through a Committee on Fortifications. Construction of the waterfront battery proceeded far beyond the Congressional appropriation, because much of the work was free, the “mechanical labor being done gratis by the carpenters of the city.” In November 1794, master carpenter Anthony Toomer, the president of the Mechanics Society, presented the fort to Governor Moultrie. The governor named the work Fort Mechanic to honor its builders. Ratification of the Jay Treaty in mid-1795 settled hostilities with Great Britain, and the federal government suspended military construction. After the expiration of the Jay Treaty in 1806, the British began harassing American shipping traffic. Fears rose that coastal cities might come under attack. The United States Department of War sent Captain Alexander Macomb of the Army Engineers to Charleston in August 1807, directing him to strengthen the city against a possible naval bombardment. Working with the Charleston Committee on Public Safety and local militia units, Macomb repaired Fort Moultrie, Fort Johnson, Fort Pinckney, and Fort Mechanic. These efforts were limited to temporary fortifications, although new guns were placed at Fort Johnson to make it “inexpedient” for a ship to come within range. The United States declared war on Great Britain in June 1812. Charleston’s various militia units manned the harbor defenses over the summer, and threw up new defensive works across Charleston Neck. With patriotic emotions running high, the city celebrated July 4, 1812, in fine style. Dress parades and rifle salutes throughout the day culminated in firework displays set off at the Orphan House and at Fort Mechanic. United States Army infantry and artillery regiments were organized to replace the volunteer militia units in the autumn of 1812. They remained in Charleston throughout the war. Although the British Navy blockaded Charleston Harbor, they never mounted a serious attack on the city and Fort Mechanic’s guns never fired on an enemy. The War of 1812 came to an end with the Treaty of Ghent, signed in Europe on December 24, 1814. 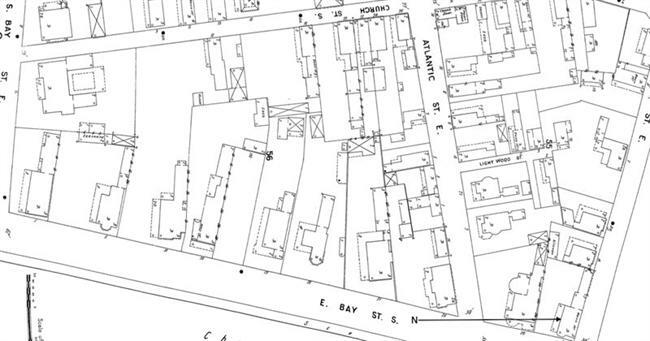 Bearss, Edwin C. The First Two Fort Moultries – A Structural History. National Park Service, 1968. Bearss, Edwin C. Fort Moultrie, No. 3. Fort Sumter National Monument, Sullivan’s Island, South Carolina. National Park Service, 1968. Moultrie, William. "A Return of the Number of Cannon &c. in Charlestown, at the Surrender, on the Twelfth of May, 1780, in the Batteries." Memoirs of the American Revolution. New York, 1802; rep. ed. Arno Press, 1968. Fort Mechanic was built on privately-owned land. 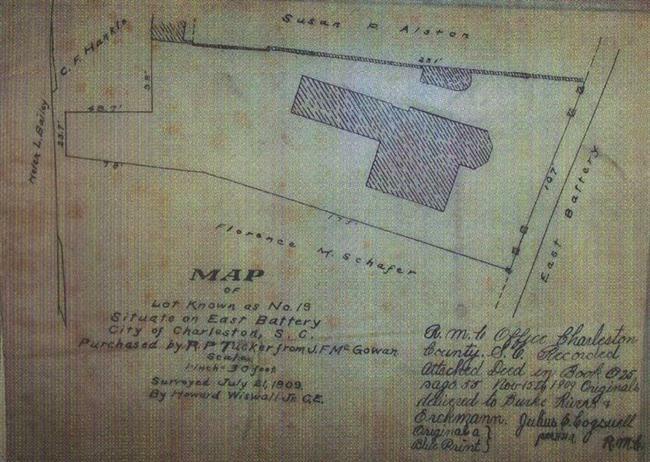 In 1795, one of several legislative acts concerning improvements to East Bay Street included a section “Compensation for land used for Fort Mechanic.” The act directed Charleston city council to pay the citizens whose property had been taken for the fort, using the proceeds from selling other public lands. In turn, the landowners were to make title to the land to the Governor of South Carolina. However, the lots were not conveyed to the state. 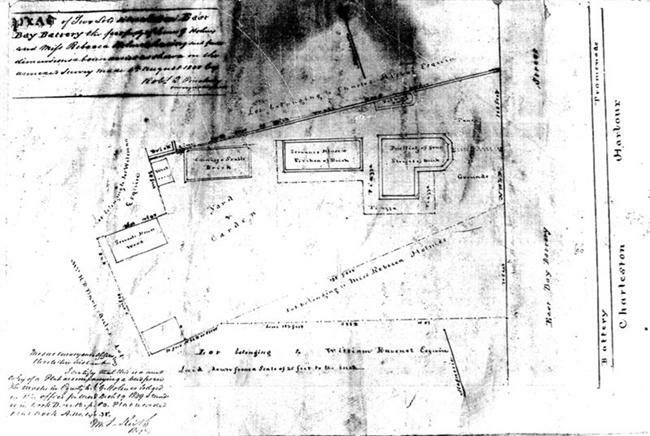 A plat made in 1796 shows Fort Mechanic stretching across lots belonging to C. Campbell’s Estate, William Holmes, Christopher Williman, and John Colcock. Christopher Williman died in December 1813, while Fort Mechanic was in active use. He bequeathed the “lots on East Bay whereon the Fort now stands” in trust for his daughter Harriet DeJongh. In February 1817, Mrs. DeJongh’s trustees sold the tract, 110’ on East Bay Street and 290’ deep, to Mrs. Elizabeth Holmes. Elizabeth Holmes and her husband, John Bee Holmes, built an imposing four-story masonry house on the site of Fort Mechanic. The residence remained in the family until 1909, continuously occupied by one or more of the adult Holmes children and their families. 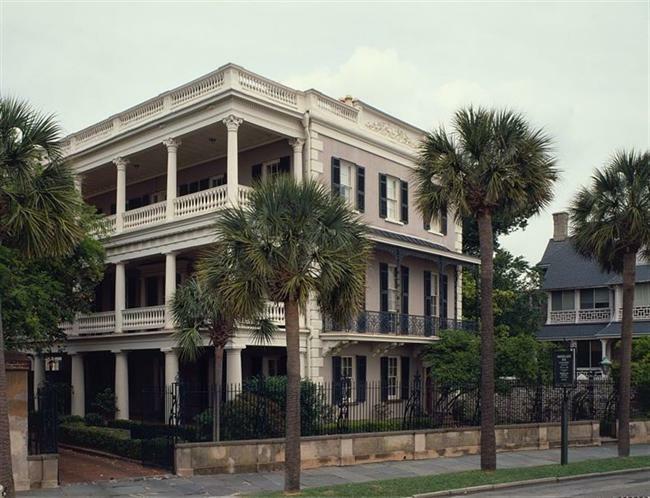 After about 1896, Elizabeth Holmes’s grandson Charles Rutledge Holmes (1845-1915) shared the building known as 19 East Battery with Mrs. Virginia Mikell’s boarding house. 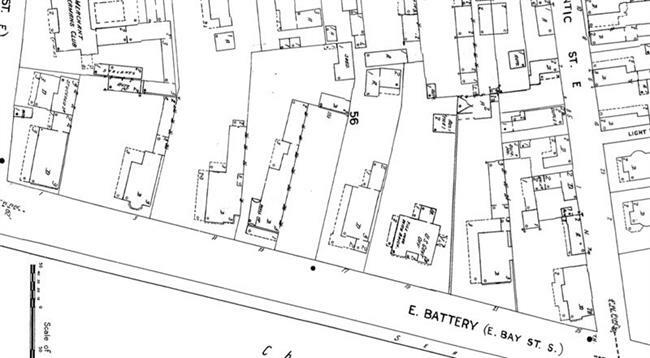 Robert P. Tucker bought 19 East Battery in 1909 from Charles R. Holmes, and demolished the building. Much of its interior trim was later reused in the 1925 residence at 46 Murray Boulevard. It has yet to be learned exactly when Tucker took down the house, or why. Whatever his reason, Tucker’s mortgage on the property was foreclosed in 1919, and Julius M. Visanska purchased the lot. Visanska retained architects Simons and Lapham to design a new residence, today’s 19 East Battery, which was constructed in 1920. 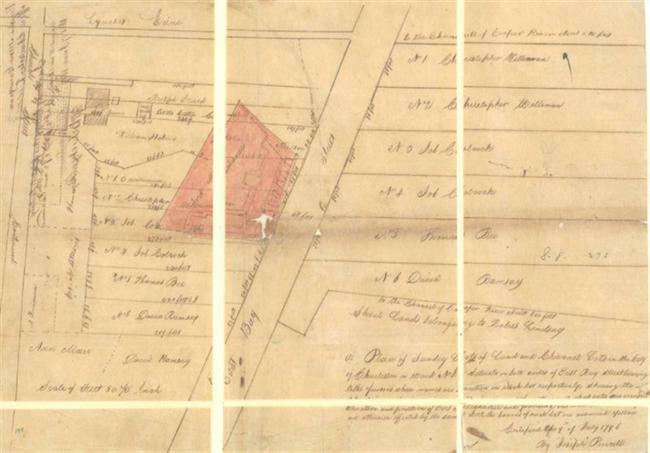 The Holmes siblings had enlarged their property in 1843 with the purchase of a seventy-foot parcel south of their parents’ home. In 1898, the next generation sold most of that lot to Nanny Miles Chisolm. She and her husband, W. Gregg Chisolm, built a house at 17 East Battery, but used it only briefly. They had begun renovating another residence, 177 Broad Street, when Chisolm died unexpectedly in November 1901. Mrs. Chisolm moved to Broad Street, and sold 17 East Battery to Benjamin R. Kittredge. 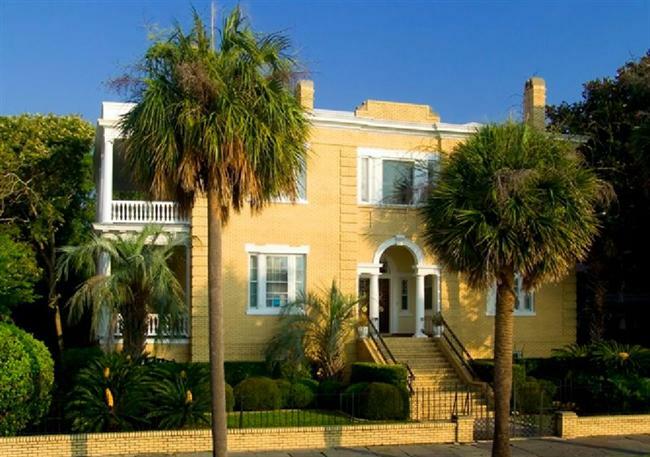 It was briefly managed as “Battery Inn Hotel” then for several years the Kittredges made this their Charleston home. Kittredge sold 17 East Battery to Florence Moulton (Mrs. William H.) Schaefer in 1908. 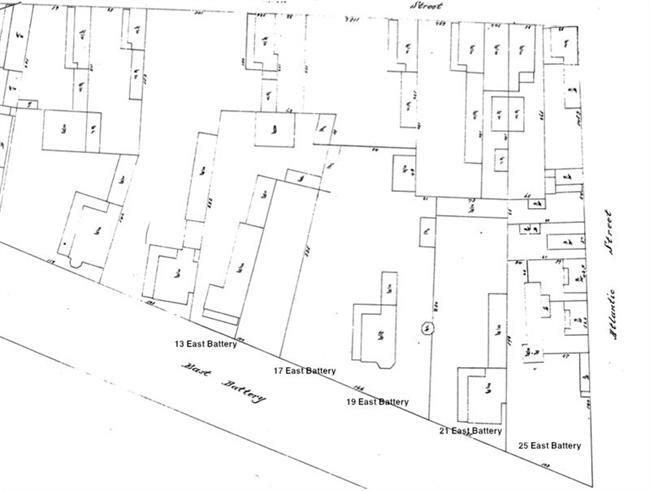 The lot north of the Holmes house, at today’s 21 East Battery, was the property of William Holmes in 1796. He sold the lot, fronting seventy feet on East Bay Street, to Charles Edmonston in August 1817. Edmonston built a Regency-style townhouse, which was purchased by Charles Alston in 1838. Alston’s additions, notably the paneled parapet and the upper level of the broad south piazza, are among the defining architectural elements of the High Battery streetscape. “Do You Know Your Charleston? 19 East Battery.” News and Courier, April 19, 1942. “Do You Know Your Charleston? 46 Murray Boulevard.” News and Courier, May 23, 1932. Smith, Alice R. Huger, and D. E. Huger Smith. The Dwelling Houses of Charleston. J. B. Lippincott Co., 1917. General location of Fort Mechanic in 1788. 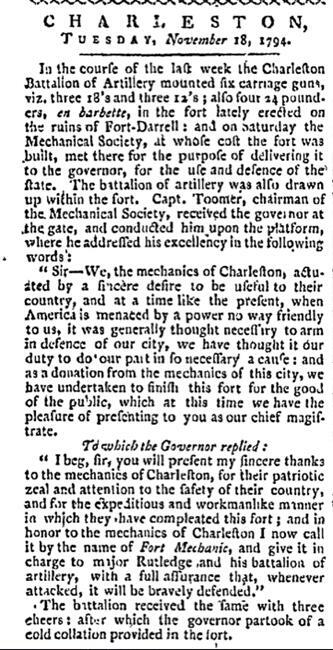 Charleston City Gazette, November 18, 1794. 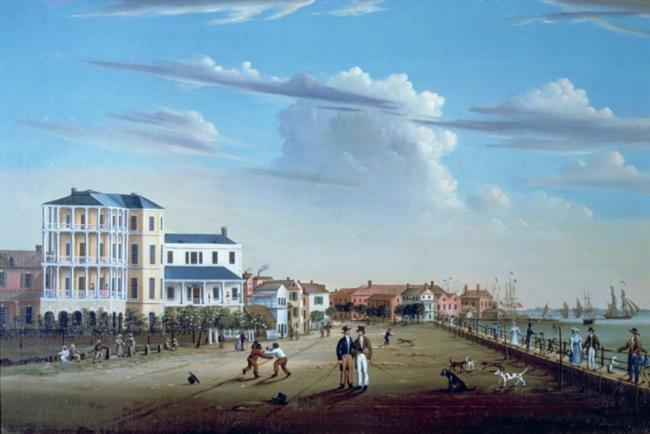 Samuel Barnard’s “View Along the East Battery,” ca. 1831, shows the Holmes House and the Edmonston House. 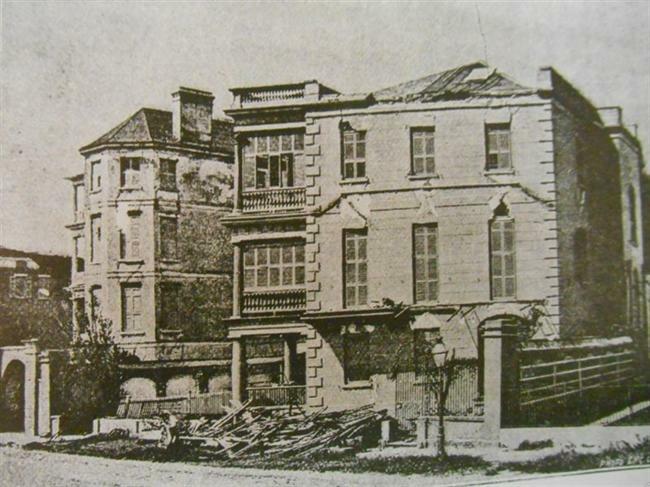 Alston House and Holmes House after the 1886 earthquake. Edmonston-Alston House, 21 East Battery. 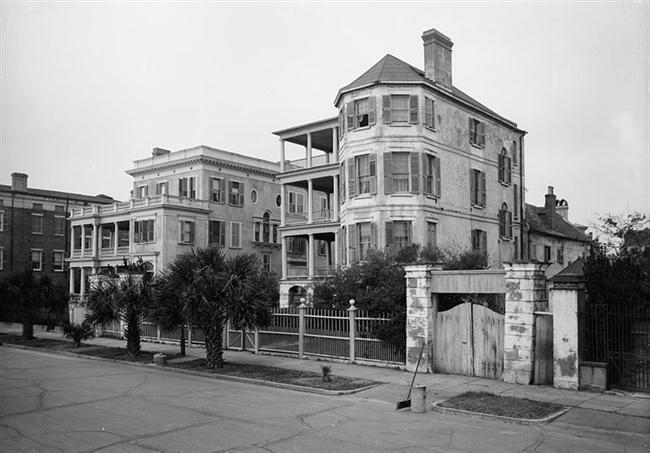 “East Battery Residences, Charleston, S. C.” shows 17 East Battery and 19 East Battery at the turn of the twentieth century. East Battery after the 1911 Hurricane. From right to left: 31, 29, 25, 21, 17, 13, and 9 East Battery. 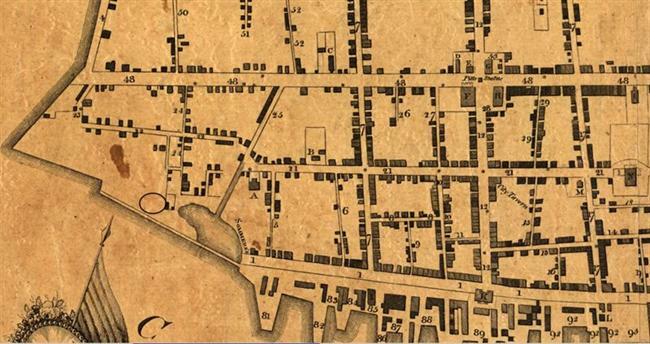 In 1843, Charleston City Council sold Rebecca T. Holmes a triangular lot fronting seventy feet on “that part of East Bay commonly called the Battery.” James G. Holmes bought the parcel from his sister for $1200, the same price she had paid. East Battery south from Atlantic Street, 1882. 17 East Battery, built 1899. East Battery from Atlantic Street to South Battery, 1902. Visanska House, 19 East Battery, built 1920. East Battery from Atlantic Street to South Battery, 1944. During World War II, the U. S. Navy used the Visanska House as offices.